The latest news from Wi-Max industry is that, wi-tribe has introduced Pocket Modem in Pakistan. This pocket Modem looks similar to PTCL's EVO device. 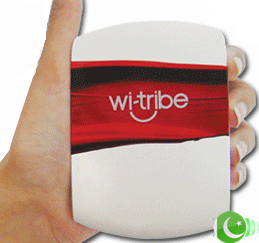 Yes it is a USB powered portable device from Wi-Tribe. This Pocket Modem will enable wi-tribe's users to enjoy an added amount of convenience with on-the-go access to High Speed broadband Internet. 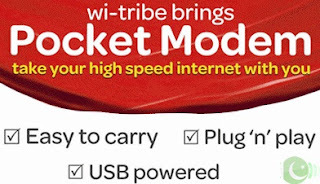 Not only this, wi-tribe has also introduced an exclusive new Package of 512 kbps with endless Monthly Volume (fair usage policy applies) with this Device. How to Get this Device ? This Pocket Modem is currently available at all customer care centers and selected retail partner locations in Rawalpindi, Islamabad, Lahore and Karachi. The working of this device looks similar to USB powered dongle and is named as Pocket Modem. The main advantage of this modem is its introductory price (activation charges) and users can take it anywhere by keeping this device in their pockets. This is just a news for information and details you can visit wi-tribe's official page by accessing the above mentioned link.